Operating under Special Use Permit, Tahoe National Forest. Have you ever wondered what you would do if someone in your group broke their leg skiing or your climbing partner was struck in the head by a rock? Every backcountry skiing, climbing or mountaineering group should have people trained in wilderness first aid skills because it's only a matter of time in before you will need to put them into use in the backcountry. 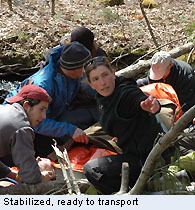 Wilderness First Aid - WFA (18 hours) is an entry level, 2 day course for those who are involved in wilderness activities. This course is the choice of many recreational skiers, climbers and mountaineers. Basic first aid skills will be taught in the classroom and practiced hands-on in the wilderness environment. This course also meets the requirements for a WFR Refresher. Bill is an Senior ASI Guide and Avalanche Program Director with many years of experience ski patrolling and teaching first aid and CPR. He is also currently the Captain with Truckee Fire Dept. "Bill Seline has a unique way of both meeting curriculum guidelines as well as the individual needs of his students. I have been taking First Aid courses & refreshers for over 40 years. Bill is by far the best instructor I've ever had�.